Reliable highways, roads and bridges are not only necessary to make sure drivers can get safely from point A to point B on a daily basis. Dependable infrastructure also helps guarantee that citizens can effectively evacuate before and return after a disaster, supports the transport of goods across the state and attracts new jobs to the area. However, in Alabama, nearly 50% of our roads are in fair, poor or very poor condition and there is a severe lack of funding to efficiently address these issues statewide. 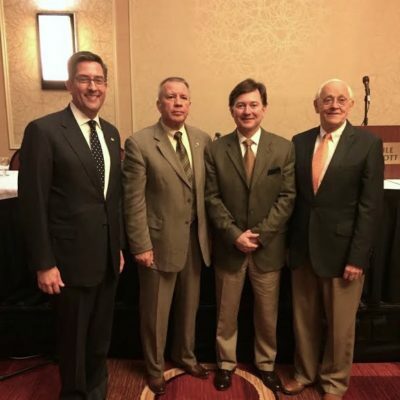 Recognizing the need to invest in Alabama’s infrastructure for a successful future, the Joint Transportation Committee (JTC) of the Alabama Legislature met with concerned elected officials, business leaders and citizens in Mobile, Alabama on January 26th, 2016 to better understand the needs of the people. Alabama’s population has grown by 20% in the last 20 years, from 4 million to 4.8 million, but infrastructure has not kept up with the growth. In the 67 counties, infrastructure needs are in the billions of dollars. The last adjustment to the state gas tax was in 1992. Alabama is ranked 5th in the nation where drivers are more likely to be involved in a fatal automobile accident. One third of those crashes are a result of roadway features. Trucks experience 243 million hours of delay and $7.8 million loss each year due to bottlenecks on Alabama’s roads. On average, Alabamians pay $320 per year in additional car maintenance due to poor roads. Mr. Lee stressed the need to reevaluate how infrastructure is maintained and improved in the state, referencing that as cars become more fuel efficient, funding for roads and bridges have suffered. “Our current funding model is not sustainable. We cannot ignore that costs are increasing and revenues are decreasing” said Mr. Lee. The benefits of investing in dependable infrastructure are undeniable, as it not only impacts safety but also future investment by industries in the area. Studies show that highway accessibility is the second most important factor to corporate executives in determining a new location for their business. 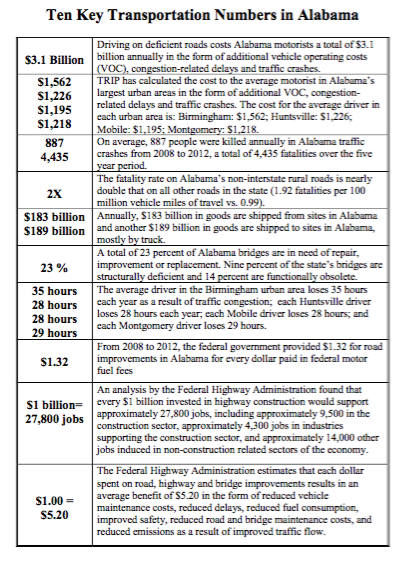 In addition, for every $1 spent on transportation infrastructure, the average benefit per person in Alabama is $5.20. Mr. Lee concluded his presentation by expressing support for “making a smart, productive investment in our future” (Mr. Lee). Following Mr. Lee’s presentation, the floor was open for public comment. The majority of speakers echoed the concerns raised by AAI and called for prompt improvement of Alabama’s roads and bridges. These speakers included Mayor Sandy Stimpson (City of Mobile), County Commissioner Connie Hudson (Mobile County), Mayor Tim Kant (City of Fairhope), Bill Sisson, Jimmy Lyons (Alabama State Port Authority), Roger Wehner (Mobile Airport Authority), Mike Lee (Build the I-10 Bridge Coalition), Kevin Harrison (South Alabama Regional Planning Commission) and Wiley Blankenship (CAP). Multiple businesses leaders referenced the need to improve infrastructure in order to remain competitive in the national and world markets while elected officials focused on the safety of the citizens and potential for job creation. During the comment period, Mr. Sisson said that “In Mobile, we’ve seen a 33% increase in manufacturing jobs in the past five years” and Mr. Wehner summarized the incredible, growing success of the new Airbus Complex. These industries, among many others, rely on excellent roads and bridges to remain competitive and need capacity to be increased in order to meet future demands. However, as Mr. Blankenship pointed out at the meeting, “commerce passing through Mobile currently adds roughly $150-200 per truck load due to constant delays on I-10.” This statistic helps show the need for infrastructure improvements throughout the state, including the building of the I-10 Bridge. CAP thanks the JTC for meeting with coastal Alabama’s local elected officials, business professionals and citizens about this critical issue. CAP is dedicated to continuing to work with partners throughout the region and state to ensure a better future for Alabama.